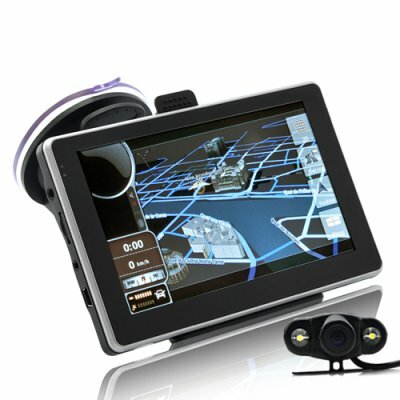 Successfully Added Car GPS Navigator - 5 Inch TouchScreen, Wireless Rearview Camera to your Shopping Cart. This new widescreen GPS navigator with wireless rear view camera comes with a colorful menu display that is accessible with the use of fingers or a stylus thanks to the ultra-sensitive resistive 5 inch touchscreen. This portable GPS navigator also comes with a glossy-black frame along with chrome trimming that surrounds the beautiful 5-inch touch screen. Looking at the unit's left side, you will notice that the SD card slot, which has been standardized on the handheld GPS navigator for years, has been changed to a more advanced compact form factor micro SD size. This change contributes to free up internal space, and next to the Micro SD card slot, there are two additional slots; a 3.5mm audio out plug-in and an AV out port for the included wireless camera receiver. It keeps getting better! The menu icons on this handheld GPS navigator come with a graphical refresh unlike tradition mainstream models, and present a more colorful interface with finer gradients. Meanwhile, the home screen has gained a top status bar displaying status icons for Bluetooth connectivity, current time, battery level, and so on. This 5 inch GPS navigator comes with a wireless rear view camera that helps you reverse and parallel park with comfort and ease. The wireless rear view camera gives drivers the confidence in reverse and parallel parking. Further-more, installing this wireless rear view camera is easy and takes a mere few minutes. The waterproof ip66 wireless rear view camera is designed to be able to handle harsh weather of the great outdoors such as snow, hail, rain and fog. A portable handheld GPS navigator is the way to go! It offers versatility, portability and above all, can be easily taken with you wherever you go. This 5 inch touchscreen GPS navigator's FM transmitter along with Bluetooth feature allow drivers to pair their cell phones with the GPS navigator to enjoy hands free calling and also to listen to their favorite music through car stereo speakers. In a nut-shell, you do not have to dismantle your vehicles dashboard and install a car DVD player if you don’t want to. A handheld GPS navigator with built in multimedia applications such as this particular one, offers users a variety of entertainment options to use right in your car. This 5 inch touchscreen GPS navigator with wireless rear view camera makes a great electronic car gadget for drop shippers and eBay resellers. This multimedia 5 inch touch screen GPS navigational unit with Bluetooth and FM transmitter is in stock now, and available at a factory direct wholesale price directly from Chinavasion. If your GPS software supports Greek, then the display and voice language will be in Greek. Most map software come with a wide selection of language choices, which means both the display and sound (voice) will be in your preferred language. However, you should carefully select and buy the map software that is best suited for your region of the world.